When Laurie visits the Kihei library, she is where she belongs. We moved here a year ago and the first thing I did was get a library card – even before I got my Hawaii drivers’ license! I love the library in Kihei. Such a great selection and the staff is so friendly and helpful. Love being able to use the computers, too. 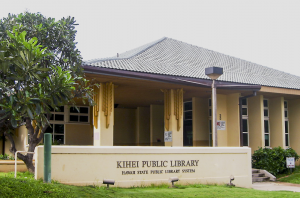 I’ve learned so much about Hawaiian history and culture, all thanks to the library in Kihei. Thank you, Laurie, for telling your story!